Kick off your Christmas party with Sydney Jet in 2019! 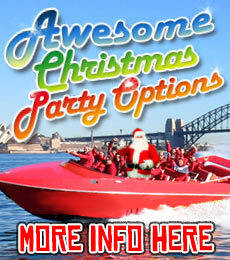 A Sydney Jet ride is an amazing way to celebrate Christmas with your colleagues and buddies. The rides are amazing and the spins, slides and wave-riding will have your crew screaming with delight and getting very merry! 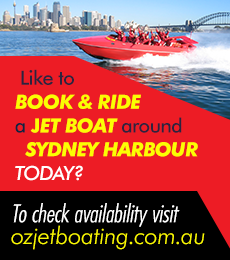 With 3 x 23 seat boats and daily departures from the Eastern Pontoon, Circular Quay, and loads of pick up locations around Sydney Harbour booking with Sydney Jet is easy, affordable and fun. If you have a water-side venue in mind please chat to us! We have been part of many awesome Christmas party transfers to locations such as Circular Quay, Taronga Zoo, Manly, Shark Island, Olympic Park and more! Let us know if you need some suggestions for restaurants/dining in the Circular Quay location and we’ll make some suggestions for you! Not available in conjunction with any other offer, subject to availability and other conditions of passage.